The contribution of materials and engineering to the shaping of society has remained consistent over time. Whereas in the past materials were relatively simply, today technological developments, relating to the composition and structure of materials at an atomic level, endow them with exactly the desired properties to allow them be manipulated as required. These materials, termed advanced materials, are as likely to define the future as simple materials have defined the past. All sectors globally are now dominated by a multitude of advanced materials. Advanced Materials research and development has become multidisciplinary. It incorporates the convergence of key enabling technologies such as of chemistry, physics and biology, which coupled with advanced engineering capability improve the competitiveness of technology based enterprises and pave the way for prosperity and employment in modern industrial societies. The economic power of highly developed industrial societies greatly depends on successes in materials technology, since many important innovative impulses can only be accomplished on the basis of new materials. Examples are medical engineering, the provision of energy conserving resources and the environment, new vehicle concepts for achieving mobility compatible with the environment or large-scale integrated components in information and communications technology. In view of growing world market potentials for R&D-intensive products, materials technology has a considerable influence on maintaining and expanding a leading technology position and thus on the creation of jobs. Materials underpin everything we do. Manufacturing and construction are entirely dependent on materials in some form. Materials technology affects most economic activities. The quickening revolution in information and communications technologies would not be possible without a wealth of novel functional materials. The current innovations in advanced materials and engineering are often the driving force for industrial product developments. Industries such as aerospace, automotive, chemicals, medical devices and ICT benefit significantly from advancements in these materials. Moreover, the industries that are significant to Northern Ireland – aerospace, automotive, medical devices, food, energy etc. look to Advanced Materials and Engineering to enhance their capability. This MATRIX Foresight Panel reviewed current research in the field of Advanced Materials and Engineering at an NI, national and international level. Based on current global trends and existing competencies within NI, five focus areas where NI has the potential to make advances that would have high commercial impact were identified. The Panel objectives are not simply to augment mainstream advanced materials and engineering themes but to recommend innovative steps where NI can achieve a step change in advanced materials and engineering thinking with the potential to offer significant economic impact. NI has Advanced Materials capability which is seen to underpin all sectors ranging from Agrifood to Aerospace. However, the quantity of R&D in NI is not sufficient for the range and size of sectors within the region. 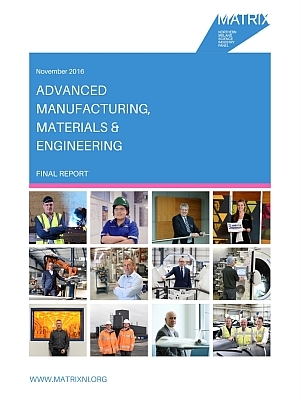 The analysis of the industrial and academic strengths shows that a rich focus area for NI is the convergence area between traditional material sectors and a focus on the interdisciplinary and multidiscipline areas of advanced materials. In these areas NI is demonstrating established competency to be globally significant in these areas and to create a niche leadership focus within the UK, Europe and the world. Additionally, there is an emerging global sector, which utilises the multidisciplinary skills of these focus areas to produce new break-through solutions to existing common themes in all sectors. This emerging sector presents a grand challenge to Advanced Materials and Engineering in NI and is called Cleantech. Cleantech encompasses a broad range of products and services, from alternative energy generation to waste water treatment to more resource-efficient industrial processes. There is a compelling need across sectors for a greater focus on environmental and energy considerations. Cleantech is the collective term for the development and bringing to market of products and processes that will allow society to sustain and improve global living standards by increasing the efficiency of existing energy and materials use, while identifying new and sustainable sources of both. Bio-based materials; farm efficiency technologies; micro-irrigation systems; bioremediation; non-toxic cleaners and natural pesticides. Does not include organic health, food or natural products. Air purification products and air filtration systems; energy efficiency HVAC; universal gas detectors; multi-pollutant controls; fuel additives to increase efficiency and toxic emissions. Optical components; reactor technologies; catalysts and membranes with multiple applications; technology enabling the manufacture of nano-scale compositions; distributed sensor network technologies. Recycling technologies; waste treatment; internet marketplace for materials; hazardous waste remediational bio-mimetic technology for advanced materials separation and extraction. Hybrid vehicle technology; lighter materials for cars; smart logistics software; temperature pressure sensors to improve fuel efficiency. The focus of Northern Ireland Advanced Materials must be on the convergence of traditional sub-fields and multi-disciplinary skills. This is not to suggest that NI cannot still operate within all other sub-fields of Advanced Materials – in fact there is an economic imperative to suggest that capability remains in all sub-fields to ensure the sustainability of industry. However the focus on the sub-fields outlined above would allow NI create a niche leadership focus in a European and Global context. Cleantech represents a key market opportunity for Advanced Materials and Engineering and is an enabler to all other sectors in NI. A focus on Cleantech can provide a grand challenge and allow NI create a global leadership position in an emerging market. Cleantech references the ability to produce energy, water, production, recovery in a manner that is very different to what has been considered heretofore. Cleantech is not traditional environmental technologies but rather is a development that is fast becoming a critical enabler for new innovations and disruptions in all sectors. Cleantech is fundamentally linked to the multidisciplinary capability of Advanced Materials and Engineering and applies new thinking that can enable cost reduction, energy efficiency and environmental considerations. NI has the opportunity to create a “first mover” position in Cleantech alongside the Scandinavians and some US states. the international recognition of this mechanism by institutions such as IMEC10, CCMR11, UK programmes, European Programmes, Tyndall and other leading materials centres. for academic excellence, and creates an international standing reputation for Northern Ireland in the selected areas. Professor Jim McLaughlin, OBE, a physicist and Fellow of the Institute of Physics, has developed significant initiatives within research, technology transfer, outreach and teaching since 1985. Professor Meenan is Professor of Biomedical Materials and Head of the Biomaterials & Tissue Engineering Research Group (BTERG) at the Nanotechnology and Integrated Bioengineering Centre (NIBEC). David Andrews worked for the Northern Ireland Centre for Competitiveness, which helps private, public and voluntary sectors to be more competitive, enabling them to grow, excel and be sustainable. Donald spent 15 years at University College Dublin teaching chemistry and researching. He then joined ePlanet Ventures where for 10 years he focused on early stage investments in disruptive information and energy technology companies. Dr. Fallaha holds a BSc and PhD from the University of Birmingham in England and his 33 year career with DuPont has seen most of his work in the UK, the US and frequent projects in Europe. Gavin Campbell has worked at Short Brothers PLC and Bombardier Aerospace since graduating with a BSc in Mechanical Engineering from the University of Ulster in 1985.He is a visiting Professor in the Faculty of Computing and Engineering at the University of Ulster and is a Fellow of the Institution of Mechanical Engineers. Ian McAuley has twenty years of experience gained in the electronics sector in Northern Ireland and has also spent time working in the United States and France. Ian holds a BSc and PhD in chemistry from the University of Ulster in Coleraine. Norman Apsley joined the Northern Ireland Science Park Foundation in 2000 as its first Chief Executive on return from England where he was involved for some thirty years in applied research and the commercialisation of research. Dr. Rob Hardeman holds the post of Senior Director at Seagate’s manufacturing facility in Springtown, working on technology transfer with external suppliers and partners, together with management of major capital projects. He is Visiting Professor at the University of Ulster (NIBEC), an elected Fellow of the Institute of Physics and a Chartered Engineer. Robert is both leader of ANSIN and Director for the Centre for Nanostructured Media at Queen’s University, Belfast. He has 23 years’ experience in the fabrication, characterisation and device fabrication of advanced functional materials. Professor Steven Bell was a Founder/Director of Avalon Instruments, which manufactures Raman spectrometers and acted as Technical Director until its recent purchase by Perkin-Elmer Inc. He is Director of Research at IMM and Chair of Physical Chemistry at QUB. Vyvyan Howard is Professor of Bioimaging, a medically-qualified toxico-pathologist and the current leader of the Nano Systems Research Group. He has held the Presidencies of the Royal Microscopical Society and the International Society for Stereology and was the General Editor of the Journal of Microscopy from 1985-91.